In February, Lilian Calderon (middle), alongside her husband, described her experience of being detained by ICE. Calderon was held by the agency after an interview designed to confirm her marriage. A judge stayed her deportation. Two federal immigration agencies coordinated a campaign to bring unauthorized immigrants who were seeking legal residency in for interviews at government offices, where they were then arrested and in some cases deported, according to internal agency communications. The interviews were timed at the convenience of Immigration and Customs Enforcement agents, who asked government officials to space out the meetings so the public would be less likely to find out about the arrests, according to e-mails between ICE agents and employees of the US Citizenship and Immigration Services disclosed in court records Monday. “As far as scheduling goes, I would prefer not to do them all at one time as it is [not] only a strain on our ability to transport and process several arrests at once, but it also has the potential to be a trigger for negative media interests, as we have seen in the past,” Andrew Graham, an ICE officer, wrote to a Citizenship and Immigration Services employee in October. 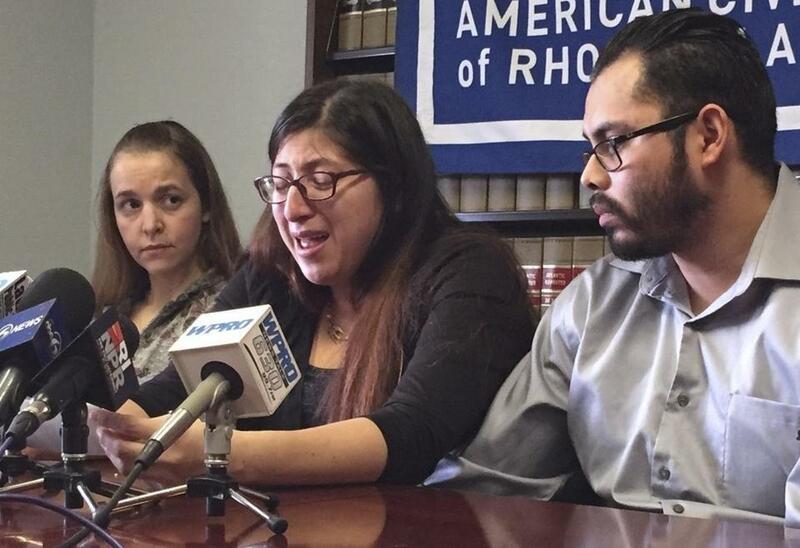 The e-mails were detailed in a motion filed by the American Civil Liberties Union of Massachusetts, which has filed a lawsuit against the Department of Homeland Security, which oversees ICE, on behalf of five immigrants and their spouses. The lawsuit challenges the Trump administration’s practice of separating married couples as one spouse seeks legal status. ICE has acknowledged that agents in the Boston field office have so far this year detained 17 people around New England at government offices where they were seeking legal status through their families, according to ACLU lawyers. Some of those immigrants have already been deported, the lawyers say. The immigrants who filed the lawsuit have received final orders of removal from the country but are married to American citizens and are seeking legal status through their spouses. Two of them, a Guatemalan mother of two and a Brazilian mother of three, were arrested earlier this year immediately after they were interviewed by officials from Citizenship and Immigration Services, the agency charged with handling residency and citizenship. The women were told by these officials that their marriages were deemed legitimate. Moments later, ICE agents came in and arrested them, according to their lawyers. E-mails and depositions of ICE agents obtained through the lawsuit show the federal agencies were working “hand-in-hand” to bring people in for interviews so they could be arrested and deported, said Matthew Segal, one of the lawyers for the ACLU. A spokeswoman for the US attorney’s office in Massachusetts, which is representing the federal government in the lawsuit, declined to comment on the filings. “In light of the fact that this case remains in ongoing litigation, we do not have a comment on this at this time, as per agency policy,” said John Mohan, a spokesman for ICE. A spokeswoman for Citizenship and Immigration Services also declined to comment, citing the pending litigation. ICE officials have said that the agency is within its rights to arrest immigrants with outstanding deportation orders, but immigration lawyers say detaining those who are seeking legal status — particularly at government offices — is highly unusual. The arrangement involves two federal agencies with separate but related tasks involving immigration. ICE enforces federal immigration laws, including arresting and deporting those living in the country illegally, while Citizenship and Immigration Services handles residency and citizenship claims and administers the country’s legal immigration system. Graham, the ICE official, described the process in a January e-mail to Todd Lyons and James Rutherford, deputy field office directors for ICE in Boston. Citizenship and Immigration Services gave ICE a list of people who had filed an I-130 petition, the most common way for immigrants to seek residency through a spouse or relative. ICE would review the list for any “significant factor that would influence our decision to take the subject into custody,” such as a criminal record or their likelihood of removal, Graham wrote. ICE would then send a list of those it was interested in arresting. “CIS schedules the interviews and spreads them out over a period of time so as not to overburden our ability to handle the workload,” Graham wrote. When the applicant arrived for the interview, Citizenship and Immigration Services notified ICE, which then sent two officers to conduct the arrest. Graham’s e-mails did not specify which arrests resulted in “negative” publicity but in March of 2017, five immigrants were arrested by ICE on the same day after they showed up at a government immigration office seeking legal residency. The sweep was widely reported. In May, Thomas Brophy, the acting director of Boston’s ICE field office, told US District Court Judge Mark L. Wolf that agents would no longer arrest immigrants during scheduled visits to immigration offices and would instead focus on immigrants who posed a threat to public safety. Soon after that, Brophy was replaced by interim field office director Rebecca Adducci, who said in a June affidavit that the practice would still be permitted. In a July 26 deposition taken by lawyers for Wilmer Hale, which has joined the ACLU in the lawsuit, Adducci said Brophy’s edict contradicted Trump’s January 2017 executive order to enforce immigrant laws. “There are no specific classes of individuals that are off the table for enforcement action,” Adducci said. Her testimony, and the e-mails between the agencies, show ICE “is entrenched in its commitment to detain and remove the noncitizen members of the putative class,” the ACLU said in its motion. The ACLU is asking Wolf to order ICE not to arrest or detain any of their clients as they seek permanent residency. The lawyers are also asking for a class certification so that all other immigrants facing similar circumstances will be represented in their complaint. Wolf will hold a hearing on the motions on Aug. 20. Adducci may be called to testify. ACLU attorneys are arguing that under Department of Homeland Security regulations, immigrants seeking residency through their families can receive “provisional waivers” that would allow them to stay in the country while they pursue a green card, even if they have final orders of removal. Those provisions were put into place to protect American citizens who would be harmed by the removal of a loved one, Segal said.